The text below describes Phases 1 and 2. Phase 2 was intended to add both the freestyle area and the downhill slalom course, neither of which were built. ALOHA SKATETOWN is not just another pile of cement. It is California's (and the world's) most exciting skateboarding facility! On our four-acre hill you will find six magnificent skating areas, an extensive pro shop, electronic game arcade, patio viewing section, and a family picnic area overlooking the park. For the skaters' comfort, we have included plenty of drinking fountains, a shaded launch area, and a non-glare skating surface. OUR COURSES INCLUDE SOMETHING FOR EVERYONE from Novice to expert. For all of your equipment needs, Aloha Surf is here to serve you with a complete store full of the latest in skating and surfing clothing and equipment. For your enjoyment before and after skating we present to you - "Sega Center", an electronic game arcade with fun for the entire family. 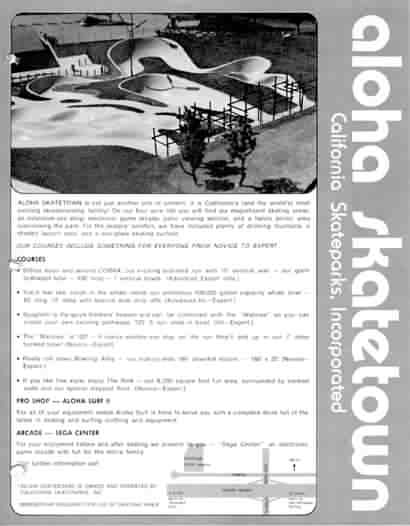 *ALOHA SKATEBOARD IS OWNED AND OPERATED BY CALIFORNIA SKATEPARKS, INC.
*MEMBERSHIP REQUIRED FOR USE OF SKATING AREA.